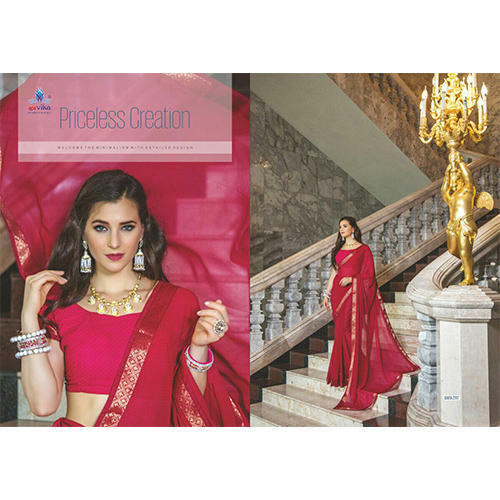 To net propelling demands and needs of our valued patrons, we are providing a stunning collection of Embroidered Designer Saree. Established in the year of 2004, we "Ethnic Trend", are highly instrumental in manufacturing, supplying, exporting and wholesaling a vast collection of Sarees and Kurtis. Product array offered by us consists of Designer Fancy Kurtis, Designer Salwar Kameez and Fashionable Straight Suits. These products are highly appreciated and demanded for their multi-color, modern pattern, soft fabric and easy to wear. We are fabricating these products in accordance to the set industry rules and standards. To meet the exact needs of our patron, we are offering these products in various colors. We are providing these products at budget friendly prices for our precious customers. We have developed a highly upgraded and well-designed infrastructure unit at our premises. We have parted our facility into various productive and functional departments for dispute free and productive environment. We regularly upgrade our facility to keep pace with the ongoing market trends and developments. Owing to our production capacity are able to fulfill the bulk requirements of the provided products. We have installed all the modern products and tools at our manufacturing unit. With the help of our highly efficient workforce and well equipped production unit, we are able to running all the process without any interrupt. We have created a huge client base across the nation.